Got a chance to pull my fenders and put my rear s1’s on. I’m still waiting for my fronts they were special ordered from Japan so they are probably still another 2 months away at least. Rear fenders had to be pulled quite a but so I’ll Reshape them a little and some smoothing then I’ll have to repaint so it will probably be a while till they are 100% finished. 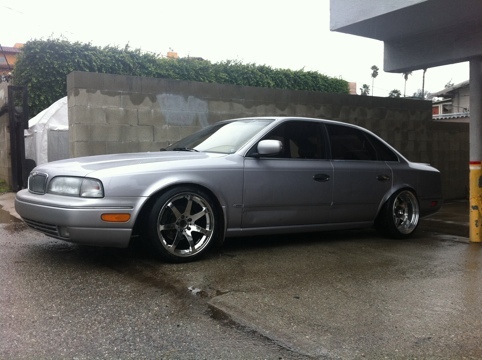 Fronts are same size as my ordered wheels 18×9.5 +8 and the rears are 18×10 -8 with 225/40-18 front and 235/40-18 rear. Probably go to 225/45 in the front when I order tires though since I think the front tires look a little small. ~ by B. Rogers on December 19, 2010.